One of the things that draws people to groups like the SCA is the ability to enter an immersive setting, and part of that setting is the elaborate garb people wear. To the experienced, garb is a simple idea, but to new people it can be a confusing topic. For guidance I took a look at the SCA website. It offered the following: “The Society for Creative Anachronism is an international organization dedicated to researching and re-creating the arts and skills of pre-17th-century Europe” and “The Society governing documents mandate that anyone may attend Society events provided he or she wears an attempt at pre-17th century clothing.” Frankly, this did not clear up any questions. Pre-17th century Europe is a very large time frame, and what exactly is considered “an attempt”? I mean, granted one can take a look at Google or Wikipedia for examples of pre-17th century “attempts,” but what if there are no examples of the garb a person is interested in? To better assist new people, I have created a system of two criteria that can be used to determine if garb constitutes a “good attempt.” If the garb does not meet either criteria, the person will be required to make a better attempt in order to attend events. Criterion #1: Historical documentation: The historical documentation criterion means the person has documented visual evidence supporting their garb choice. In simpler terms they have a scroll, illumination, carving, or statue that shows the garb they are wearing is correct for the time period of the SCA. If the garb meets criterion #1, they are good and may attend events. Criterion #2: Temporarily I am calling this criterion the “Magnus Garb Suitability Standard” or MGSS. This is a working title that I expect to change once these criteria become SCA law. MGSS is broken into three assumptions. If the garb meets any two of the three assumptions the garb is considered “acceptable” and the person is allowed to attend events. Popular cultural assumption: This means the garb fits into the popular cultural assumption of what garb of that time period might look like. Granted it might not be correct, but for the most part people will assume it is correct because it is a “popular assumption of accuracy” even if it is not historically accurate. Disassociated temporal/cultural assumption: This means the garb is not the correct time period of the SCA, but it is difficult to tell what time period the outfit originates from and therefore it does not disrupt the atmosphere of the event. Equally, while this assumption covers cultures that might not be European, a logical connection can be made as to why the garb is acceptable. Connected theme assumption: The connected theme assumption is used when the garb is not the correct time period of the SCA but contains elements that connect with elements of the SCA. As such, when people see it, they will assume it is correct. 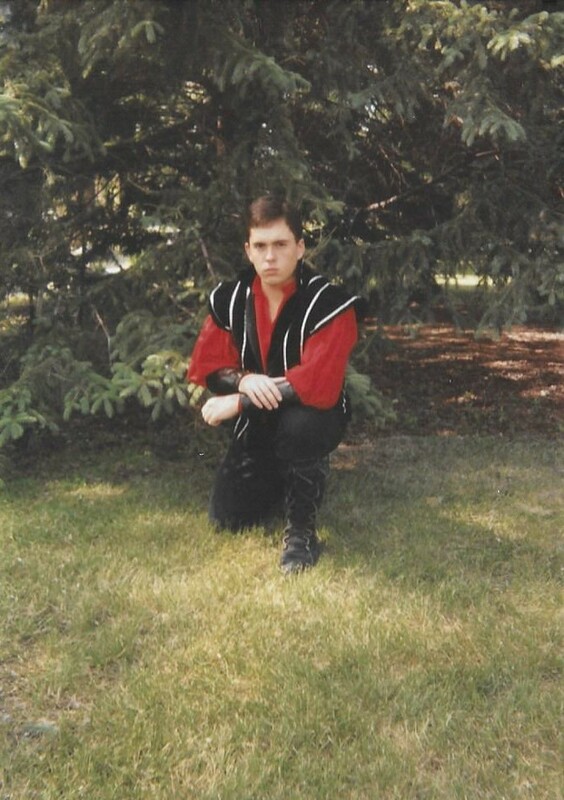 Here we see one of my first attempts at garb. A simple doublet and baggy shirt. It is not 100% historical, however it is an acceptable “attempt” because it meets all three assumptions. It is a popular look often seen in movies and TV shows, so people will assume it is correct at first glance. It is difficult to tell what time period it is from, but is obviously not modern. There is also an argument for connected theme because I am wearing leather arm guards, which are a common element of period garb. 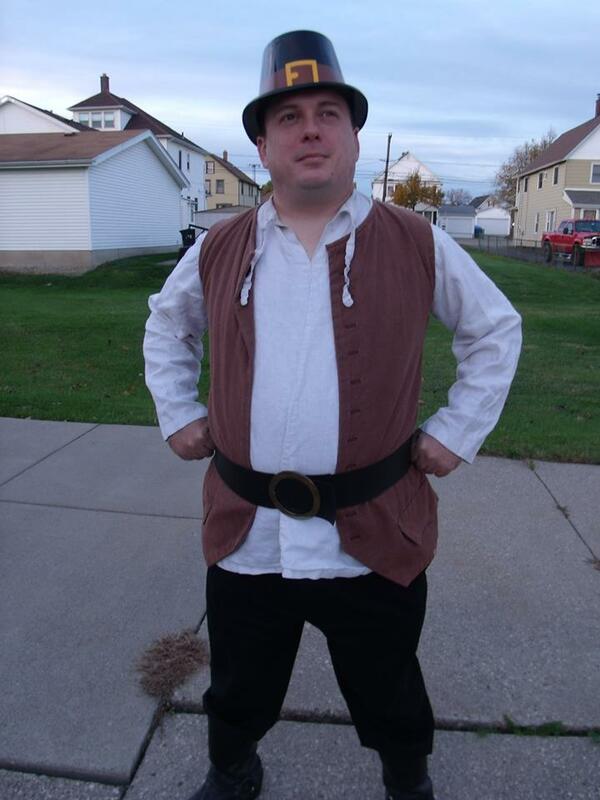 Here we see another attempt at garb that I call “The Dwarf”. This attempt only meets two of the assumptions. It does not meet assumption one because it is hard to determine what time period I am attempting. A fair argument, since I am actually from Middle Earth. However it is still a valid “attempt” because assumption 2 dictates that if you can’t identify the time period, but it is obviously not modern, it is a “good attempt”. 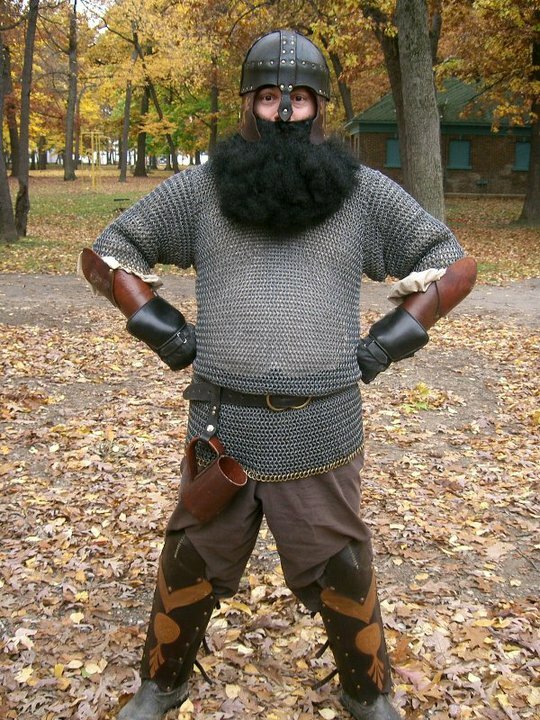 Additionally it meets the rules for assumption number 3 because I am wearing armor (very medieval), have a leather mug suitable for mead or the blood of my enemies, and I am sporting a beard which is historically proven a popular choice of many cultures before the invention of shaving in 1640. The previous examples are easy. This time let’s apply the assumptions to something harder. Now in this example, I cannot claim assumption one because it is difficult to determine what time period or culture I am shooting for. I also cannot claim assumption number two because even though it is obviously not modern, I have opted for a plastic hat and plastic was not invented until 1987. Lastly I cannot claim assumption three because the outfit has no connected themes. This is a fail! However if I changed to a cowboy hat and added a belt knife I could easily make this work. This last outfit is difficult because there is almost no outfit to judge. However, while on the surface this may seem like a fail, this outfit meets all three assumptions. Many movies and books show medieval people with no pants or shoes. Success. 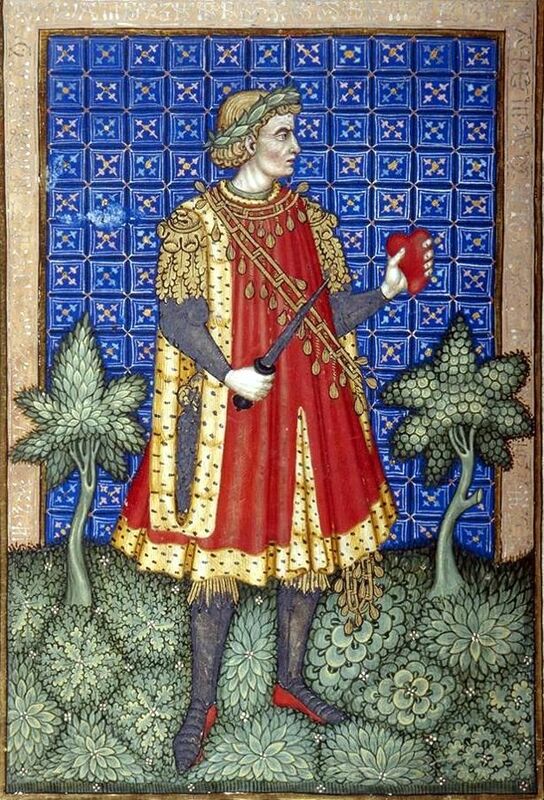 This outfit might not be the correct time period for the SCA, but it also not modern. It also has two connective elements. 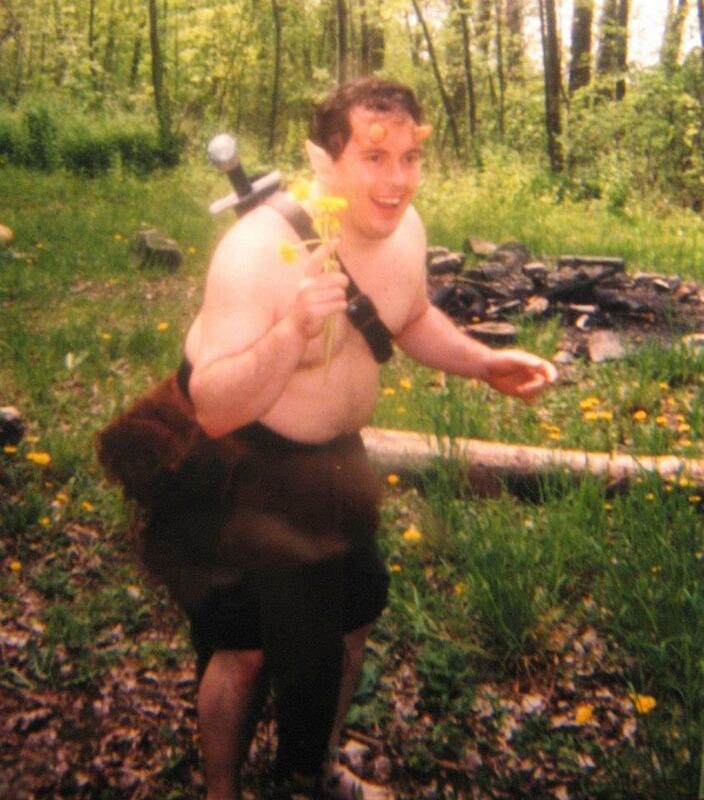 I am wearing a sword (period) and I am carrying a flower (a historical documented element of the SCA time period). Thank you for your time. I hope that, once made into law, these criteria will not only improve the SCA, but make it more inclusive to new people.